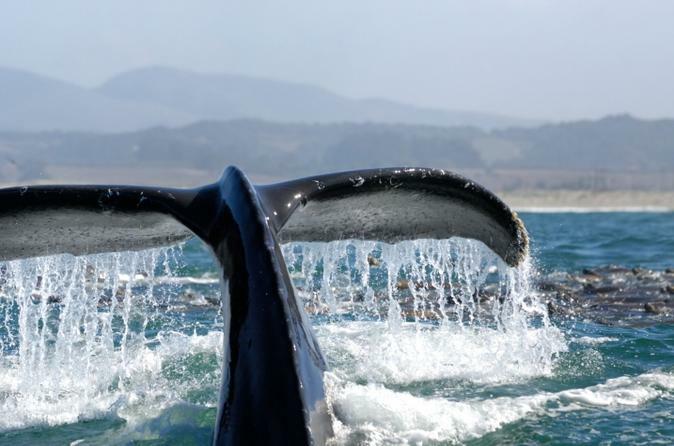 Join us aboard the 65 ft /45 passenger excursion vessel to experience the spectacular adventure of whale watching and nature cruises off the Palos Verdes Peninsula in the beautiful South Bay along the Redondo Beach, Palos Verdes, Manhattan, Hermosa and Santa Monica Coastline. The boat offers inside and outside seating along with a galley serving wine, beer, soft drinks, coffee, tea and snacks. The 2.5 hour Whale Watch trips have a high percent whale-sighting success rate, visitors are likely to spot the magnificent Gray Whales as well as Fin, Minke, Humpbacks and Sperm whales, along with other wildlife thriving off the Southern California Coast including sharks, various species of seabirds, such as the majestic pelicans, graceful terns, and other ocean dwellers such as Mola Mola, as well as playful dolphins, seals, sea lions and flying fish. Board the ship and enjoy the seasonal migrations of the California Gray Whales November through May and Year Round are always on the lookout for the larger, pelagic Blue and Fin whales when their feeding patterns bring them into our lovely Redondo, Hermosa, Manhattan beach & Santa Monica Bay. In addition to whales, expect to see Sea Lions, Dolphin, Porpoise, Seals, and a myriad of beautiful and unusual sea birds, some of which are never seen near land, Huge Sea Turtles and darting Minke Whales, giant Mola Mola and shoals of Sardines and Anchovies may be encountered. There is seating both inside and on deck and food and beverage service is aboard. All boats have a well earned reputation for finding whales in the Bay.